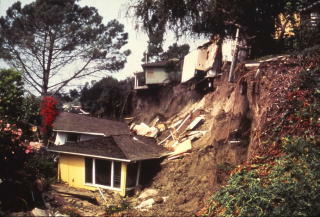 Learn risks - Ask your local emergency management office if your property is a “landslide-prone” area. 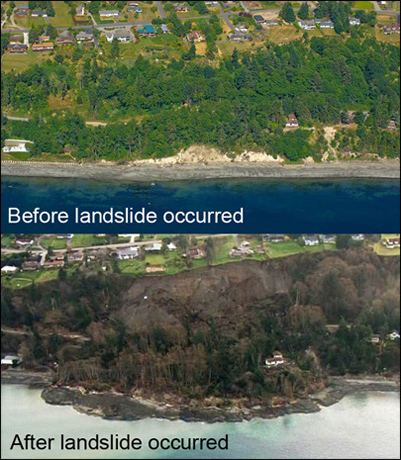 Or call your County or State Geologist or Engineer or visit the USGS Landslide Hazards Program. Recent fires? - Be aware that areas hit by wildfires have an increased risk of landslides and mudflows once the rainy season starts. Be prepared to evacuate - Listen to local authorities and leave if you are told to evacuate. Where would we go? - Decide in advance where you would go in case you can’t return home for weeks or months .. or ever. If your home is damaged or destroyed or you’re forced to leave your home due to on-going threats (like mudslides or flooding), you’ll need to find temporary or permanent living quarters. This could mean staying in a public shelter or hotel, living with friends or relatives, or renting a home or apartment in the middle of all the chaos, so discuss several options now. Then, write down those options and share them with relatives and friends. Reduce risks - Plant ground cover on slopes and build retaining walls. Strange sounds - Listen for trees cracking, rocks banging together or water flowing rapidly (esp if near a stream or river) - debris flow may be close by. Move it! - Whether you are in a vehicle, outside, or in your home – GET TO SAFER GROUND! Be small - If there is no way to escape, curl into a tight ball and protect your head the best you can. Listen - Local radio and TV reports will keep you posted on latest updates or check with your local police or fire departments. Don’t go there - Stay away from the area until authorities say all is clear since there could be more slides or flows. Replant - Try to fix or replant damaged ground to reduce erosion, possible flash flooding or future landslides. Call an expert...? - Consult a professional landscaping expert for opinions and advice on landslide problems. Also call an expert out if you discover structural damage to home, chimney or other buildings. Insurance - If your home suffers any damage, contact your insurance agent and keep all receipts for clean-up and repairs. Clean and disinfect everything that got wet (bleach is best) since mud left behind by floodwaters can contain sewage and chemicals. Wear gloves, mask and eye protection when using disinfectants.